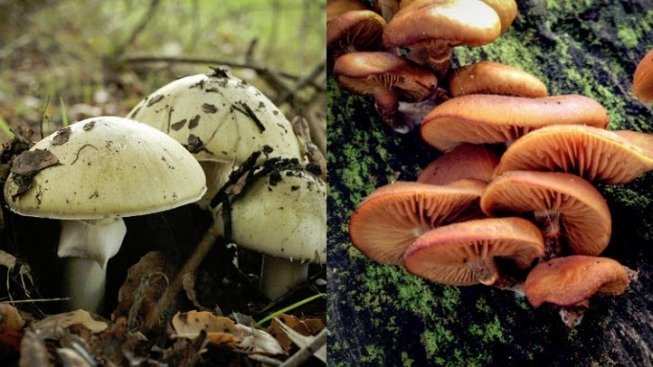 The East Bay Regional Park District is warning Bay Area residents not to collect or consume mushrooms in East Bay parks, as the region is home to two of the most toxic mushrooms in the world. After the first fall rains, it is common for the East Bay Hills to sprout mushrooms in an array of size and color. They can be beautiful but they can also be deadly, EBRPD officials warn. The amanita phalloides (death cap mushroom) and amanita ocreata (western destroying angel mushroom) both contain amatoxins, a group of molecules that inhibit cellular metabolism in many animals. In mammals, the liver and kidneys are usually the organs affected initially after indigestion. Symptoms could appear up to 12 hours after consumption and could progress into liver and renal failure if treatment isn't sought right away. "Both are robust mushrooms that grow near oak trees," EBRPD Naturalist Trent Pearce said in a statement. "Both are very dangerous and contain lethal toxins." The death cap is a medium-to-large-sized mushroom that typically has a greenish-gray cap, white gills and a white ring around the stem with a large white sac at the base of the stem. The western destroying angel is a medium-to-large-sized mushroom that often has a creamy white cap, white gills and a white ring around the stem that disappears with age. It usually has a thin white sac at the base. "We urge the public to be safe and knowledgeable about toxic mushrooms," said EBRPD spokesman Dave Mason in a statement. "Park visitors should know mushroom collecting is not allowed anywhere in the East Bay Regional Park District." Mason also advised dog owners to keep their dogs away from the mushrooms.